ANDREE'S handmade luxury soaps are made from organic and food grade oils and butters. No animal fats (sodium tallowate on a soap ingredient label) are used in ANDREE'S soaps. ANDREE'S encourages you to read ingredient labels and be an informed consumer regarding your soap and cosmetic ingredients. Please e-mail ANDREE'S at the contact link if you have any questions about ingredient labeling of our products. The FRAGRANCE FREE soap has been used by hospitals and cancer care centers for chemotherapy and radiation patients since 1998. The FRAGRANCE FREE soap is also used by individuals with psoriasis and eczema. 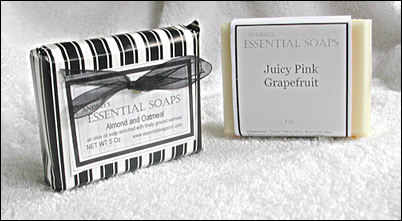 The LEMON VERBENA soap was selected as a part of the 34th Emmy Award Gala Gift Bags. ANDREE'S soaps are not medical treatment and are not intended to treat or cure any disease.